NEW G.I. STYLE 1QT. STAINLESS STEEL CANTEEN WITH BUTTERFLY HANDLE CUP (BRUSHED MATTE FINISH). MADE OF FOOD GRADE STEEL. IMPORTED. 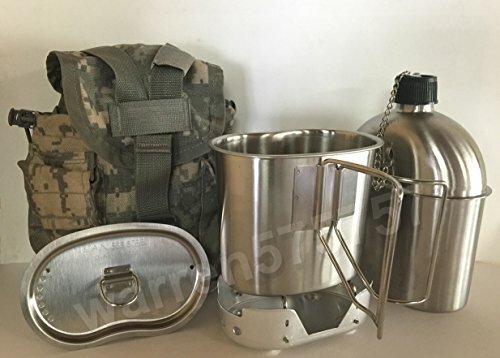 WITH STAINLESS STEEL VENTED LID, AND NEW (ALUMINUM) CANTEEN CUP STOVE FOLDABLE, WITH USED SURPLUS GENUINE G.I. ISSUE (ACU MOLLE II) CANTEEN COVER. MADE IN U S. SOME MIGHT HAVE SOME SPOTS, AND SOME MARKINGS BUT THEY ARE ALL FUNCTIONAL GOOD CONDITION. NEW STAINLESS STEEL CUP STOVE Compact lightweight cook stove will burn trioxane, hexamine or good old Sterno fuel. Raised feet, Side slot vents and fold-down pot supports make this convenient backpackers, hikers, campers stove that's easy to transport. Capacity 1 Qt. ; Material: Stainless Steel.